Originally published in 1984, Maelstrom is probably the first British RPG to receive critical acclaim and be successful. It helped that it was published at the height of the Fighting Fantasy craze and that it was released by the same publisher—Puffin Books, an imprint of Penguin Books. The slim paperback offered a semi-historical RPG set in the late Elizabethan Age, one in which nobles, professionals, craftsmen and artisans, tradesmen and labourers, as well as mercenaries, priests, mages, and rogues investigated the supernatural and had other adventures. Although the book went out of print, it was welcome news when it was announced in 2008 that Arion Games would not only be republishing the game, but would be supporting it with supplements such as The Maelstrom Companion and Beggars Companion. In 2013, Arion Games released the second edition of the game. Maelstrom Domesday is that second edition, but it not a simple reprint of the Elizabethan-era set Maelstrom, but rather a prequel, still set in England, but the eleventh century rather than the sixteenth. Set in 1086, just twenty years after the Norman invasion, it presents a country still recovering repeated invasions—by the Scots and the Danes; from repeated rebellions and suppressions within; and finally from the ‘Harrying of the North’, the violent suppression of not just a series of Anglo-Saxon uprisings, but of the Anglo-Saxon peoples in the region, resulting in the death of tens of thousands. This is the year in which the Domesday Book, a great survey of the men and lands of the King William the Conqueror is completed, even as the king’s attention continues to be divided between consolidating his rule over England and holding off the French king’s designs upon Normandy. Thus the king’s men cannot be everywhere and when his peace is disrupted, the taxes cannot be collected,, there are further signs of rebellion, or things that cannot truly be explained, other powerful men of the kingdom are prepared to step in to support both king and church. Often they cannot act directly and arrange to have their agents act for them—agents such as the player characters, who each have had some kind of encounter with the supernatural that is the Maelstrom…! Characters in Maelstrom Domesday are ordinary men and women—they can be archers, beggars, craftsmen, huntsmen, knights, ladies, men-at-arms, outlaws, peasants, priests, squires, and wisemen/wisewomen. It should be noted that this is historical game, which means that there are many occupations that will not be available to female characters. Further whilst magic using characters are possible, it is rare that one will be rolled up during character creation and if a player wants to specifically play one, then it should be by design rather than roll of the dice. The creation of characters—a process which owes much to Traveller via Warhammer Fantasy Roleplay—starts with Attributes such as Attack Skill, Will, and Perception. These start out at the base level bar some minor adjustments for each character’s adolescence. Each player will then roll for his character’s Racial Origins—Norman, Anglo-Saxon, Irish, Welsh, or Dane, and his Social Class—Outcast, Peasant, Townsman, or Lesser Nobility. A character also has three characteristics, such as Education, Strong Grip, or Wise, also rolled for, with most of them being advantages. Then, at the age of thirteen, the character begins his first Career, again rolled for. The Careers available to a character are dependent on his Social Class. Outcasts have a high chance of being Rogues, Outlaws, or Beggars; Peasants of being Peasants; Townsmen of being Craftsmen or Traders; and the Lesser Nobility of being Squires. Each Career lasts between three and five years, grants bonus points to a character’s Attributes, gives a Rank in two Abilities, the chance of receiving certain resources, some monies, and a table of Career Exits. At the end of each Career, unless the character rolls under his age and brings the creation process to an end, this table is checked to determine what Career the character will take next. Lastly, the Career indicates the table on which the character should roll for a Random Event. For the most part, a character will remain in the same Career for some time. For example, each term in the Priest Career lasts five years. The character receives dice rolls to add to his Persuasion and Will Attributes, plus a die roll of points to assign to any Attributes; a rank in each of Religion and Literacy Abilities; and a few silver pennies and the chance of being given a Latin Bible. On the Career Exit table, the Priest will probably remain as a Priest, but might be promoted to a Deacon or Chaplain, or become a Monk, Wiseman, Clerk, or even an Outlaw. A slim chance allows a random roll on the First Career table or a player to choose. For that term, the Priest should roll on the Sedentary table for his Random Event, which might give the result that he falls madly in love, finds an ancient tome of knowledge—and improves his Knowledge Attribute, or his house is burnt down and he loses his accumulated possessions. At the end of the character creation process, a player can freely select a Rank in any Ability for each of the two terms served. The character also ages if over thirty years of age, and can roll his name if so desired. Lastly, he needs to roll for a supernatural encounter that will bring him to the attention of his Patron, which must also be rolled for. Lastly, the player should work his character’s history using the game’s timeline along with the Random Events that have occurred to the character. Lastly, each character two further statistics; one is Favour, a measure of his Patron’s regard for him, the other is Imbalance, a measure of mental well-being. Thus character creation is quite a lengthy process, with the results ranging from a teenage peasant to a forty year old veteran. Our sample character is Eirik Thorgestson, the son of merchant, a cousin of Sweyn Forkbeard, the first Danish king of England. He grew up strong and arrogant, ugly and ill-liked were it not for his father’s wealth and his willingness to use his fists. Apprenticed to his father’s trading house, a mentor took the young under his wing and managed to smooth some of the rougher edges of his character as well as allowing him to make some interesting contacts. He signed on with one of these contacts, a merchant who made journeys down to London and then beyond to Paris. Not though just as a merchant, for he had to help defend the merchant’s caravans and so he trained as a soldier, first as a mercenary before becoming a sergeant-at-arms. A fall from a horse, caused by the appearance of a fireball in the sky, resulted in his fracturing his right leg. The long months necessary to his recovery led to his being discharged from service. Eirik Thorgestson is not a good looking man, but he has learned not only to overcome his ugliness, but to use to his advantage. This he can back up with his martial prowess if necessary. Currently he hopes to make more money trading, or at the least gain a better income for his sword skill. If necessary, he can survive off the land. Unlike the majority of other RPGs, Maelstrom Domesday is not a skill-orientated game. For the most, to do anything, all a character has to do is make a Saving Throw against one of his Attributes. To swing a sword at a bandit, a character would roll against his Attack Skill, to recall a quote from the Bible would require a Saving Throw against the Knowledge Attribute, and so on. Nevertheless, from one term to the next, a character will acquire Ranks in Abilities, each Ability representing professional expertise and knowledge. For most Abilities, such as Gossip or Stealth, each Rank grants a bonus to a relevant Saving Throw. Initially, most grant the simple permission to use the Ability, for example, Woodlore at Rank I enables a character to perform basic tasks, before granting simple bonuses at greater Ranks. Others grant permissions at each and every Rank. Thus at Rank I, Religion lets a character lead common services, at Rank II have him know specific services and be able to preach, and so on. Combat Training improves a character’s expertise at inflicting damage and withstanding it, whilst Strong Draw increases damage done with the Missile Skill Attribute. Combat itself maintains the simplicity of rules in Maelstrom Domesday, with characters making opposed Saving Throws of their Attack Skill and Defence Skill Abilities, or alternatively, their Missile Skill. Weapons are quite deadly, with both wounds and blood loss tracked separately—accumulated damage in excess of a character’s Endurance causes unconsciousness and death occurs at twenty points above that. It is possible for a character to inflict Serious and Critical Wounds, their effects being determined by weapon type. It takes time though, for a character to recover from any damage taken and the RPG’s advice is that combat be used sparingly. What combat in Maelstrom Domesday does model is that training will invariably triumph over the unskilled, character creation not allowing easy access to the Combat Training Ability. Similarly, Magick is treated in a light fashion in Maelstrom Domesday. It is first based first around a Characteristic—either Hedge, Low, or High Magick. This indicates the degree to which a character has a natural link to the Maelstrom and limits the Rank in his Magick Ability. Unlike other Abilities, the Ranks run only from I through V rather than VI, as do the Grades of the desired spell effects, for it should be noted that Maelstrom Domesday foregoes the spell lists of other RPGs. Instead, the Referee determines the Grade of the effect that the mage or wisewoman desires, the Grade depending on its likelihood of occurring. So getting a guard dog to bark would be very likely and thus Grade I, whilst trying to run across a river would be highly improbable and so be Grade V. To cast the ‘spell’, the mage would need to make a Will test to see if he knows the spell and then a Will test for each Grade of the spell. So one Will test for Grade I spell and three for the Grade III spell. The effect of multiple Will tests is not just that it makes spells of a higher Grade more difficult to cast, it also increases the chances of the caster rolling a ‘0’ on the roll. Each ‘0’ increases the chance of a breach in the Maelstrom, perhaps a foul miasma is released or some horrid creature is able to enter the mortal world. Will is also used to withstand mental shocks such as witnessing a violent death, starving to death, or seeing certain creatures that have from the Maelstrom. Fail these Will Saving Throws and a character acquires Imbalance, which if exceeds his Will Attribute causes him to go insane. Unlike Endurance, Imbalance is particularly difficult to recover from. 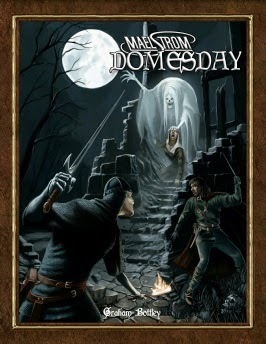 Physically, Maelstrom Domesday is a simple black and white book, cleanly and tidily presented. Although it needs another edit here and there, the writing is solid and the game is supported with well-done examples of the rules. The sometimes poor handling of the period art is fortunately offset by the new artwork, especially that of the figure work done to illustrate each of the game’s careers and the thumbnail portraits done of the many NPCs in the game’s setting of York. The descriptions of the villages, the town, and the city are accompanied by sections devoted to local folklore as well as an adventure hook. Although there are plenty of these throughout Domesday Maelstrom, they are each quite slight and do not give the Referee all that much to work with. As simple as the rules are in Domesday Maelstrom, the RPG is neither a simple game nor a game suited to beginners—particularly for players. The background information necessary to play is not as upfront and as accessible as it could be, the result being that some of the nuances of, and the tensions within the setting are not as immediately obvious. Further, although the advice for the GM on the game’s mechanics and on running the game is decent enough, it could have been stronger in terms of handling and running investigations, let alone creating them. Certainly the inclusion of a good scenario as an example would have gone some to alleviate this issue. In the long term, a timeline beyond 1086 would have useful, as would a more extensive and prominent bibliography than the one included. These all are, it should be noted, relatively minor issues, ones that should impede the creation and running of a good game in the hands of a competent Referee. In presenting a second edition of the original Maelstrom rules, Domesday Maelstrom benefits from a cleaner and tidier ruleset, an engaging means of character generation, and a setting that possesses more depth than the game might suggest at first sight. The publisher recently made available a Quickstart version of the rules. The Maelstrom Domesday Quickstart can be downloaded for free from RPGnow.